• MAKE THE MARINADE: Whisk together the beer, chipotle and salt and pour into a large sealable bag. 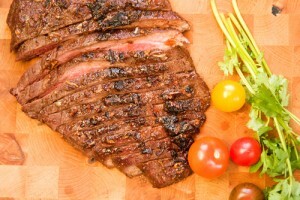 Add the steak and marinate in the refrigerator, turning once, for at least 1 hour or up to 24 hours. • MAKE THE SALSA: Right before you cook the steak, make the salsa and guacamole. To make salsa, combine the tomatoes, jalapeño, scallions, cilantro, lime juice and salt in a medium bowl. lime juice and salt. Cover and refrigerate. • Preheat grill to medium-high. Clean the grill rack. Dip a piece of crumpled paper towel into a small bowl of canola oil. Grasping the oiled paper towel with long-handled tongs, rub over the grill rack. Oil the grill rack or brush grill pan with oil. • Grill the steak, turning once, about 10 minutes total for medium. Grill pepper quarters and onion slices until lightly charred and tender, about 10 minutes total. Let steak rest 5 minutes on a clean cutting board before thinly slicing against the grain and then chopping into bite-sized pieces. Chop the pepper and onion. guacamole, cheese, sour cream and hot sauce on tostada shells.